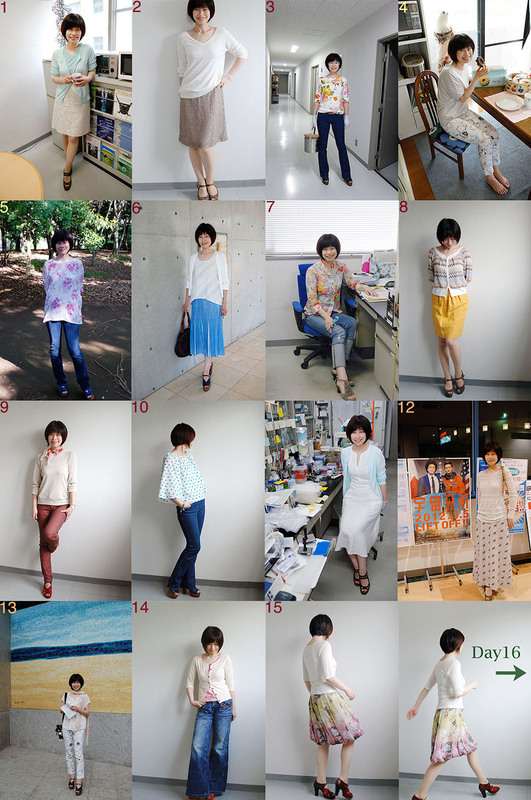 Here are my outfits for day16-31. It was the last day of Me-Made-May challenge. The challenge was so much fun. Though I'm a bit exhausted at this moment. I started to love my past projects more. I could decide to say good-by to some garments for good. I could have so many reunions with lovely me-made garments that had been sitting in the closet silently. I confirmed which style I like on me. And what I like not so much (on me). I found that the world is small. And I felt our world is unlimited. My brain seems too tired to compose clever sentences today. In short, I accomplished my goal and it is marvelous. To see the original pictures that I posted at MMM'12 Flickr group, please find the guest pass link for the set, here. I came to a half way of my entire Me-Made-May '12 challenge! I'm feeling relaxed and happy with how it goes so far. I'm trying to choose my outfit as normal as possible too. By looking back my last 15days, I found that I'd better plan more designed tops as well as simple ones, because in the closet I have lots of skirts without any matching top. I also found that I had less clothes than I had imagined. That is good, because it indirectly means I have few unwanted me-made clothes. If you would like to see the original pictures that I posted at MMM'12 Flickr group, please find the guest pass link for the set, here. These me-made skirts are from the same pattern, which is a very simple above-knee A-line skirt. This is one of my old patterns and I totally know of how it fits and looks on my hip. I use this pattern endlessly and I have created a thousand copies with the combination of different fabrics and small modifications. If you say that those two skirts are the same, you're totally right. If you find that they look different, you're equally right! 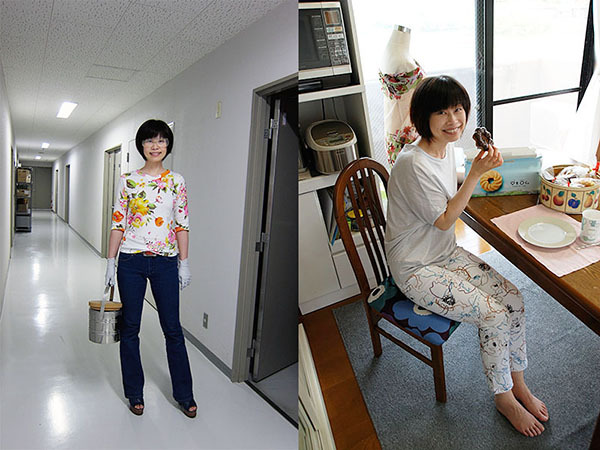 I simply thought it might be interesting to look at the same skirt in different fabrics on two days serially. So I chose them for day1 and day2. The white silk one is rather stiff and shimmers a lot. It holds A-line. The pink brown lace one is flowy and looks long because it hangs like fluid. Both me-made pairs of pants are also from one basic stretch skinny jeans pattern. I made the flare pair in an indigo denim and the other skinny&cropped pair in a floral print. I was initially thinking that I'd post my report for MMM once a week, but now I think I'll post my reports on MMM challenge less frequently. I found that I'd love to focus my mind on the challenge more. I remembered that it took very long for me to prepare one blog post too. Eek, I'm so slow and inefficient to do this kind of things. But probably it's better to be inefficient than to try nothing, don't you think? I hope you're enjoying this month!